Become an Abolitionist. Support Fair Trade. We have an idea of what that means, from our history lessons; galling physical labor… small amounts of food…whips. But we don’t usually think about it now. After all, our country has been free from that kind of slavery for generations. It is not a thing of the past. And the chocolate that we see at the store, that we give as gifts, or eat for a comforting snack, is often a product of slavery. Most chocolate plantations on the Ivory Coast, including the ones that supply Nestle, Hershey, Ghiradelli, and Mars, utilize slave labor to work their cocoa crops and produce their chocolate. The majority of the slaves are children from poor families, who are bought, coerced or captured into the trade between the ages of five and seventeen years old. They regularly use chainsaws to clear forests, spray harmful chemical pesticides without protective clothing or gear, use machetes to harvest cocoa beans, and carry 100-pound bags of cocoa back to be processed. Many have scars from the machetes. If they do not work quickly enough, they may be beaten. And most have not even tasted chocolate. “Aly Diabate was almost 12 when a slave trader promised him a bicycle and $150 a year to help support his poor parents in Mali. He worked for a year and a half for a cocoa farmer who is known as “Le Gros” (“the Big Man”), but he said his only rewards were the rare days when Le Gros’ overseers or older slaves didn’t flog him with a bicycle chain or branches from a cacao tree. Aly said he doesn’t know what the beans from the cacao tree taste like after they’ve been processed and blended with sugar, milk and other ingredients. “I don’t know what chocolate is,” said Aly. Aly is only one of the fifteen thousand children forced to work under these brutal conditions. The horrible truth of slavery should make you never want to touch that kind of chocolate again. 70% of the worlds cocoa comes from the Ivory Coast in Africa. 15,000 are captured, beaten, forced to work, underfed and not paid. 40% of child slaves on cocoa plantations are girls, while the other 60% are little boys. 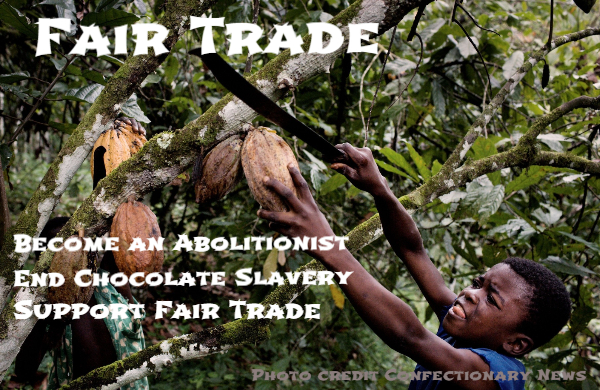 Fair Trade ensures that the farmers are paid fair prices, making slavery less of a temptation for plantation owners. Fair Trade organizations regularly inspect member plantations, and will not certify or ship any chocolate that has been produced by or with the aid of slaves, child or adult. Ever since our family became aware of the serious and ugly issue behind most commercial chocolates, they lost their appeal. We just can’t enjoy the taste knowing it’s likely that someone’s young son (or daughter) was cruelly abused to produce it. We’ve been buying fair trade chocolate and cocoa ever since. This Valentine’s Day, treat your special ones to chocolate that not only tastes good, but is produced virtuously and ethically as well. Be an abolitionist. Buy Fair Trade Chocolate.